The Land Rover Series I, II, and III (commonly referred to as series Land Rovers, to distinguish them from later models) are off-road vehiclesproduced by the British manufacturer Land Rover that were inspired by the US-built Willys Jeep. In 1992, Land Rover claimed that 70% of all the vehicles they had built were still in use. Series models feature leaf-sprung suspension with selectable two or four-wheel drive (4WD); though the Stage 1 V8 version of the Series III featured permanent 4WD. All three models could be started with a front hand crank and had the option of a rear power takeoff for accessories. 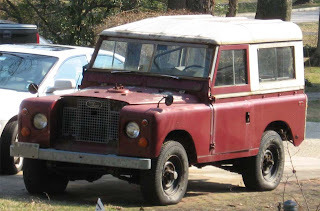 The Land Rover was conceived by the Rover Company in 1947 during the aftermath of World War II. Before the war Rover had produced luxury cars which were not in demand in the immediate post-war period and raw materials were strictly rationed to those companies building construction or industrial equipment, or products that could be widely exported to earn crucial foreign exchange for the country. Also, Rover's original factory in Coventry had been bombed during the war, forcing the company to move into a huge "shadow factory" it had built during the war inSolihull near Birmingham to construct aircraft. This factory was now empty but starting car production there from scratch would not be financially viable. Plans for a small, economical car known as the M Type were drawn up, and a few prototypes made, but would be too expensive to produce. Maurice Wilks, Rover's chief designer came up with a plan to produce a light agricultural and utility vehicle, of a similar concept to the Willys Jeep used in the war, but with an emphasis on agricultural use. He was possibly inspired by the Standard Motor Company, who faced similar problems and were producing the highly successful Ferguson TE20 tractor in their shadow factory in Coventry. More likely, he used his own experience of using an army-surplus Jeep on his farm in Anglesey, North Wales. His design added a power take-off (PTO) feature since there was a gap in the market between jeeps and tractors (which offered the feature but were less flexible as transport). The original Land Rover concept (a cross between a light truck and a tractor) is similar to theUnimog, which was developed in Germany during this period. The first prototype had a distinctive feature—the steering wheel was mounted in the middle of the vehicle. It hence became known as the "centre steer". It was built on a Jeep chassis and used the engine and gearbox out of a Rover P3 saloon car. The bodywork was handmade out of an aluminium/magnesium alloy called Birmabright, to save on steel, which was closely rationed. Paint was also in short supply, resulting in the first production vehicles making use of army surplus green paint. The first pre production Land Rover's were being developed in late 1947 by a team led by engineer Arthur Goddard. Tests showed this prototype vehicle to be a capable and versatile machine. The PTO drives from the front of the engine and from the gearbox to the centre and rear of the vehicle allowed it to drive farm machinery, exactly as a tractor would. It was also tested ploughing and performing other agricultural tasks. However, as the vehicle was readied for production, this emphasis on tractor-like usage decreased and the centre steering proved impractical in use. The steering wheel was mounted off to the side as normal, the bodywork was simplified to reduce production time and costs and a larger engine was fitted, together with a specially designed transfer gearbox to replace the Jeep unit. The result was a vehicle that didn't use a single Jeep component and was slightly shorter than its American inspiration, but wider, heavier, faster and still retained the PTO drives. The Land Rover was designed to only be in production for two or three years to gain some cash flow and export orders for the Rover Company so it could restart up-market car production. Once car production restarted, however, it was greatly outsold by the off-road Land Rover, which developed into its own brand that remains successful today. Many of the defining and successful features of the Land Rover design were in fact the result of Rover's drive to simplify the tooling required for the vehicle and to use the minimum amount of rationed materials. As well as the aluminium alloy bodywork (which has been retained throughout production despite it now being more expensive than a conventional steel body due to its ideal properties of light weight and corrosion resistance) other examples include the distinctive flat body panels with only simple, constant-radius curves (originally used because they could be cut and formed by hand from aluminium sheet on a basic jig) and the sturdy box-section ladder chassis, which on Series vehicles was made up from four strips of steel welded at each side to form a box, thus cutting down on the complex welding operations required when making a more conventional U- or I-section frame. From 1979 until 1985, the Stage 1 was built using some of the same components as the Range Rover and 101 Forward Control, such as the LT95 gearbox and 3.5-litre Rover V8 petrol engine. The engine was detuned to 91 hp (68 kW) from the 135BHP of the contemporary Range Rover. The Stage 1 was normally available only in LWB 109-inch (2,800 mm) form but 24 examples were built with the SWB 88 in (2,235 mm) wheelbase. "Stage 1" refers to the first stage of investment by the British Government in the company to improve the Land Rover and Range Rover product offerings, which eventually led to the Land Rover 90 and 110. The use of the Range Rover engine and drive train made it the only Series III vehicle to have permanent four-wheel drive. 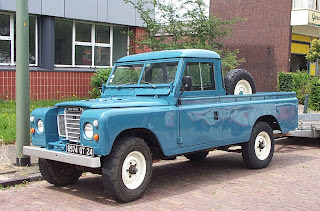 The 1 Ton 109 inch - produced from 1968 to 1977, covering late IIA and series III Models. It was basically a Series IIB Forward Control built with a standard 109 in body, featuring 2.6-litre petrol engine, lower ratio gearbox, ENV front and rear axles, (Salisbury front and rear on later Series IIIs) though some late IIAs were fitted with ENV axles in front and Salisbury on the rear. Later series IIIs had a Rover type front axle with uprated differential. The chassis frame was unique to the model and featured drop-shackle suspension similar to the military series Land Rovers. 900x16 tyres were a standard feature and these machines were commonly used by utility companies and breakdown/recovery firms. Only 170 IIA and 238 Series IIIs (1 Ton) were built for the home market. Export markets had even fewer examples, making this one of the rarest types of Land-Rover ever built. Australia has always been an important export market for Land Rovers of all sorts, but especially the utility models. 80-inch Series I models were sold to the Australian government in the late 1940s for work on civil engineering projects such as dams and road construction, which brought the vehicle to the buying public's attention. Large sales followed and in the 1950s Land Rover established factories in Australia to build CKD kits shipped from the Solihull factory. 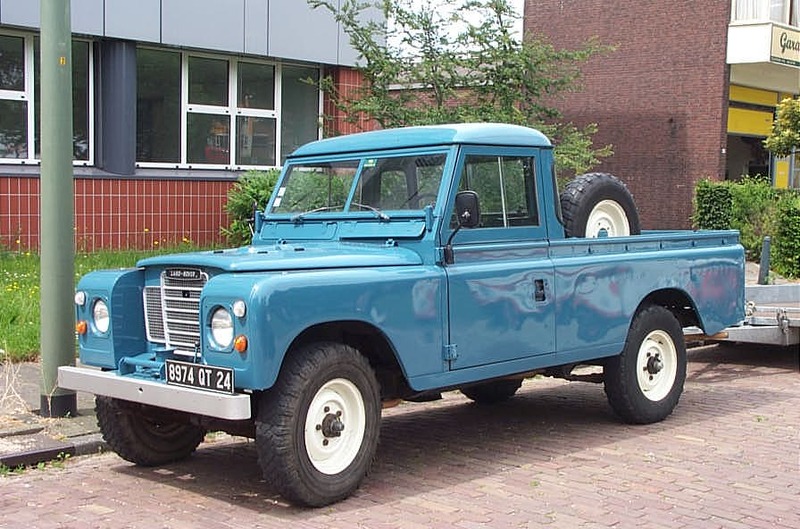 The Land Rover continued to sell well throughout the 1960s in Series II guise, commanding some 90% of the off-road market, and with practically every farm having at least one Land Rover. The Series III continued this success in the early 1970s, but from the middle of the decade sales declined. A large coal export deal to Japan relied on the subsequent import of Japanese cars and other goods, a combination of this increasing competition and increasingly poor quality of the components being shipped from Britain meant that Land Rover's dominance slipped. A problem specific to Australia was the always-limited supply of new Land Rovers. Leyland's factory never had the capacity to meet possible demand and the need to import almost the entire vehicle in kit form from Britain restricted the supply and manufacturing process further. This led to a long waiting list developing for the Leyland product whilst commercial operators could receive large fleets of Japanese vehicles very quickly. The other problems faced by Land Rover were the same throughout its export markets- compared to the Japanese competition, the Land Rover was underpowered, unreliable and slow with a poor ride quality, despite their superior off-road ability. Poor rust-proofing and low-quality steel used in comparison to the Japanese vehicles turned the buyers away in large numbers and by 1983, with the introduction of the One Ten, the Toyota Land Cruiser became the best-selling 4×4 in Australia. In the early 1980s, Land Rover Australia had made some changes to the vehicle to try to combat this sales decline. As well as the fitting of the V8 petrol engine in the 1979 "Stage One", as in the rest of the world, Australia also received the same vehicle with the option of a 3.9-litre 89 hp (66 kW) four-cylinder Isuzu diesel engine. This helped slow the sales decline, but the rest of the vehicle's shortcomings let it down. The One Ten was also available with this engine, and a turbocharged version producing in excess of 100 horsepower (75 kW) powered the military 6×6. The British Army used Series Land Rovers in large numbers (and continues to use the modern Defender versions). The British Army tested the 80-inch (2,000 mm) Series I Land Rover almost as soon as it was launched in 1948. At that time, the Army was more interested in developing a specially designed military utility 4×4 (the Austin Champ). However, the Champ proved too complex, heavy and unreliable in battlefield conditions so the Army looked to the Land Rover. In the late 1940s the Ministry of Defence was keen on the standardisation of its vehicles and equipment. Part of this plan was to fit Rolls-Royce petrol engines to all its vehicles (even though most were not actually built by R-R). A batch of Series I Land Rovers were fitted with Rolls-Royce B40 four-cylinder engine, which required modification to an 81-inch (2,100 mm) wheelbase). However, the engine was too heavy and slow-revving, which stunted performance and produced torque that the Rover gearbox could only just cope with. Rover convinced the MOD that, considering the quantities of Land Rovers they were considering ordering, that the standard 1.6-litre engine would suffice. The MOD started ordering Land Rovers in batches from late 1949. The initial batches were for 50 vehicles, but by the mid-1950s the Army was buying Land Rovers 200 vehicles at a time. Land Rovers were deployed to the Korean War and the Suez Crisis, and became standard light military vehicles throughout the Commonwealth. However, as the 1960s progressed, more and more specialised versions were developed. As well as the standard 'GS' (General Service) vehicles, a common variant was the 'FFR' (Fitted For Radio', which had 24-volt electrics and a large engine-powered generator to power on-board radios. There were also Ambulances on the 109-inch (2,800 mm) Series II and Series III chassis. A well-known version was the LRDPV (Long-Range Desert Patrol Vehicle), commonly called the 'Pink Panther', on account of their distinctive light pink sand camouflage. These 109-inch (2,800 mm) Series IIs were stripped of doors and windscreens and fitted with grenade launchers, a machine gun mounting ring and long-range fuel tanks and water tanks. They were used by the SAS for desert patrol and special operations. By the late 1970s, the British Army had acquired around 9,000 Series III models, which were mainly a special 'Heavy Duty' version of the 109-inch (2,800 mm) Soft Top. These models had improved suspension components and a different chassis cross-member design. These were produced in 12-volt 'GS' models and 24-volt 'FFR' versions. A small number were 88-inch (2,200 mm) GS and FFR models, but in general the Army used the Air-Portable 1/2 ton, 88-inch (2,200 mm) "Lightweight" version. The Lightweight was in service by many armies all over the world. 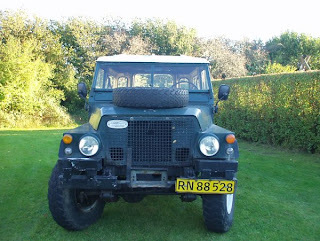 In Europe even the Dutch Landmacht and the Danish Army used the Land-Rover Lightweight. Instead of the petrol engine the Dutch and Danish Lightweights had diesel engines. 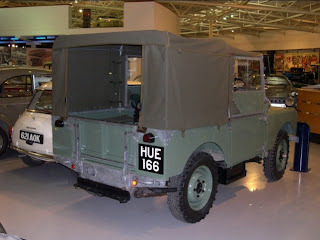 Instead of the canvas top the Dutch ones had PVC tops like the modern Land Rover 'Wolf'. In addition, there were also 101-inch (2,600 mm) Forward Control models, 109-inch (2,800 mm) FV18067 ambulances built by Marshall Aerospace of Cambridge. The Royal Navy and Royal Air Force also acquired and maintained smaller Land Rover fleets during the 1960s and 1970s. The RAF used 88-inch (2,200 mm) models for communications, liaison, personnel transport and airfield tractor duties. The Royal Navy's fleet was, understandably, small and consisted mainly of GS-spec and Station Wagon versions for personnel and cargo transport. All British military Land Rovers used the 2.25-litre four-cylinder petrol engine. However, some overseas customers (such as The Netherlands) specified the 2.25-litre diesel unit instead. The Land Rover is also the basis for the Shorland Internal Security Patrol Vehicle developed by Short Brothers. The Australian-made series 1, 2, 2A and 3 were widely used by the Australian Army, Royal Australian Navy and Royal Australian Air Force. Most were GS (General Service) mobility vehicles with variants built as Long Range Patrol Vehicles, ambulances, command reconnaissance cars, fire tenders and ceremonial vehicles. The first was delivered to the Army in 1948 and the series 1 gradually replaced the World War II era Austin Champs and Jeeps. The series 2 was introduced in 1958, the 2a in 1963 and series 3 in 1973. 72 of the series 2 were fitted as an anti-tank "gunbuggy" with a 106mm recoilless rifle. The Land Rover Perentie, a military variant of the Land Rover Defender, was introduced in 1987. Over 2,500 four wheel drive and 400 six wheel drive remain in service. The New Zealand Army purchased 640 of the Australian-made series series 1 between 1951-1953. A similar number of series 2 were purchased in 1959-1962 and a small batch of series 2A in 1965-1967. New Zealand purchased a small number of ex-Australian series 2 and 2A vehicles in 1971-72, out of the pool used by the ANZUK force in Singapore. 566 of the series 3 were purchased in 1982-83 and as of 2012 around 320 of these remain in service. Minerva of Belgium produced a version of the Standard Vanguard, under licence from the Standard Motor Company. 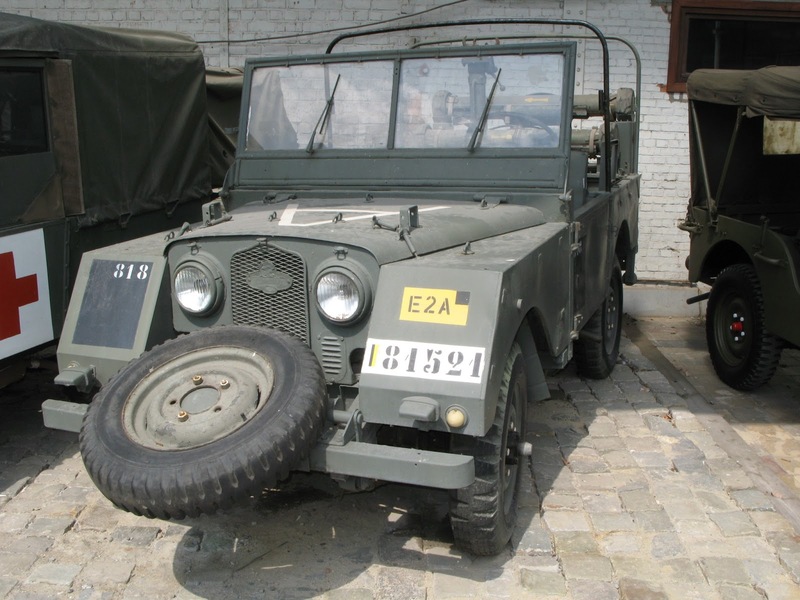 When Belgium's army needed a lightweight 4×4 vehicle, the head of Minerva, Monsieur van Roggen approached Rover in the spring of 1951. On 21 June, Rover discovered that they were competing against Willys Jeep for the contract. 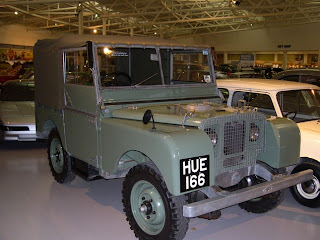 In October 1951, the deal was agreed and in 1952, the Minerva-Land Rover was produced. The Rover company supplied technical support for Minerva and allowed Minerva to produce Land Rovers under licence to Rover. Arthur Goddard, Rover Assistant Chief Engineer and head of Land Rover development was in charge of approving the changes Minerva wanted to make to the Land Rover as well as setting the factory up to assemble the vehicles.